I have waited two years to try La Bodega de Santiago situated in Yaiza, we dined at this restaurant on the edge of the Timanfaya Mountains at the weekend, and it did not disappoint. This restaurant is situated in a 200 year old house, which was named after Santiago Eugenio who was one of the first people to welcome visitors to the Montañas del Fuego (Fire Mountains). 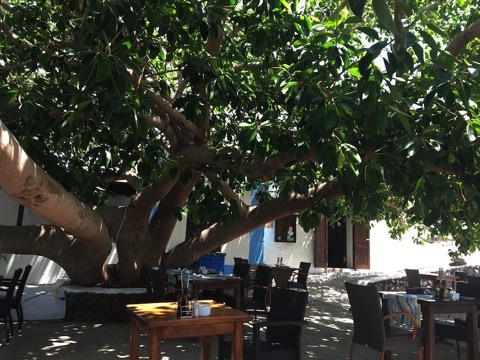 The spectacular rubber tree which dwarfs the building provides a wonderful dappled shade for dining alfresco beneath. On cooler days or evenings, there are tables within a variety of small dining rooms inside. It was a glorious summer day, so we sat on the terrace and I was pleased to see the tables were well spaced out. We enjoyed a caña served in cute glass jars whilst we waited for our friends to join us. Our waiter described the specials in addition to the standard menu and we decided to order three starters to share between the four of us. These were off the special menu and included carpaccio of Lanzarote tuna with sea snails, prawns from La Santa and a lobster tail salad. We decided that the Bermejo Malvasia Seco white wine would be the perfect accompaniment for our starters, which were served in three separate courses to the table. The first to arrive was the tuna carpaccio, a couple of us were unsure if we’d like the sea snails, but we needn’t have worried, they were delicious! The tiny snails were pickled and reminded me of cockles, the wafer thin tuna was fabulous, served with diced red onion and bread thins. Our second starter was the lobster salad, which was unlike any I’d eaten before. Both the lobster tails and tomatoes had been grilled, adding a warm and smokey flavour to the salad, it was superb. Our third starter was a plate of grilled prawns from La Santa, quite simply served with a squeeze of lemon and towels to wipe our fishy fingers with afterwards. Another delicious dish, the prawns were easy to peel and bursting with flavour. We really appreciated that our starters had been served one at a time, we’re so used to tapas style eating where everything can arrive at once, it was really nice to linger over each dish. For our main course, I ordered the secreto ibérico a special cut of pork fillet which had been flavoured with orange juice. The meat was gorgeous cut into strips with hand cut chips, and drizzled with a tangy orange jus. Miguel’s sirloin steak was a lovely piece of meat, served with foie gras on the top plus mushrooms and chips. I was quite full and after browsing the dessert menu, I decided to order the polvorones, which are crumbly shortbread biscuits served with a shot of sweet Muscatel dessert wine. A perfect end to a sumptuous lunch. Regarding price, when we mentioned we were dining here, there were a few comments of nice but pricey. Our meal worked out at €40 a head including 2 bottles of wine. Starters were priced from €5 upwards and main courses from €14. Our advice, enjoy the food and location, you won’t mind paying the price, it’s worth it and highly recommended. Bodega de Santiago can be found on the road from Yaiza towards Timanfaya, they are closed on Mondays. 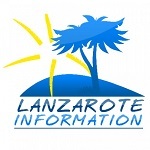 Please note: We don’t inform restaurants in advance that we’re coming to write a review, nor do we receive any payment or benefit in kind for our restaurant reviews, our aim is simply to tell you about seriously good food in Lanzarote.